Congratulations! You’re on your way to being a homeowner. The first step, and one of the most valuable ones, is to gain as much information and education as possible before jumping in. Not being prepared only leads to disappointment and frustration, not to mention confusion about the buying process. 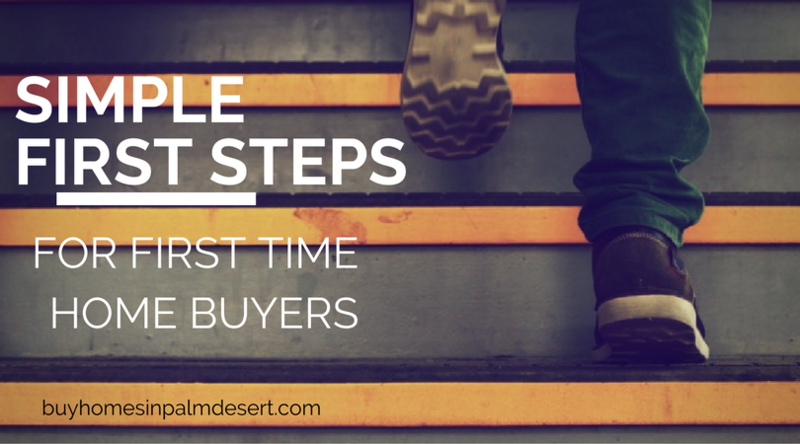 I want to explain the process and the steps involved so that you can make a better decision on buying your first home in Palm Desert, La Quinta, and surrounding areas. Know how much you can afford before you look at homes. I can’t stress the importance of this first step. If you’re applying for financing and a home loan you’ll need to know how much you can afford before looking at properties. If you start looking at homes first and find one you love only to discover later that you can’t afford it, it can be very discouraging. Sit down with a lender, go over your finances, discuss your income and your outgo and the mortgage officer or lender will offer you a letter of pre-approval stating that you’ve already done your financial homework and are prepared to purchase a property. Once you have this letter in hand you can confidently search in your price range. Make a list of necessities that you think you’ll need, those that you can tolerate not having, and things you know you certainly don’t want. You'll want to be in a specific school district? Want a fenced yard? Is a one or a two-story home your choice? How many bedrooms and bathrooms do you need? How far away do you want to be from markets and restaurants? These are all details that you’ll need to consider instead of just throwing caution to the wind and start with a blanket search. Once you’ve narrowed down a few homes that you’ve seen either online or in person, let me know which ones you’d like to see further. It’s not a bad idea to drive by and through the neighborhood to see if the property lives up to its online pictures. Once you find a home you love, I will help you compile a solid offer that sellers are looking for. We will negotiate for your price and your terms until mutual acceptance is acquired. The transaction then moves on to a home inspection. This step is extremely important. You will be making a very large investment and knowing all you can about it just makes smart financial sense. Have a professional inspection and if there are any additional inspections I urge you to have those completed as well. A few hundred dollars now can save you thousands in the future over major repairs that you didn’t know about. Once the inspection contingency and any other addenda and contingencies are satisfied, escrow will put together the paperwork and title to your satisfaction. I would be happy to walk you through this step personally until I can hand you over the keys to your new home.